VIOLA—The Life and Times of a Hull Steam Trawl­er, just pub­lished, is an engross­ing read in its own right, and is rid­ing the crest of a wave of interest in all mat­ters World War I, espe­cially as it affected the Brit­ish at home. Some 800 trawl­ers and their crews, already engaged in the most dan­ger­ous civil­ian occu­pa­tion, were requisi­tioned from the Hull and Grimsby fleets into the war effort, to hunt U-boats and sweep for mines, and so keep open the ship­ping chan­nels on which Bri­tain depended. One quarter of those ves­sels were lost, along with half their crew com­ple­ment. Viola was one of this fleet of armed trawl­ers, and engaged with U-boats on a num­ber of occa­sions. 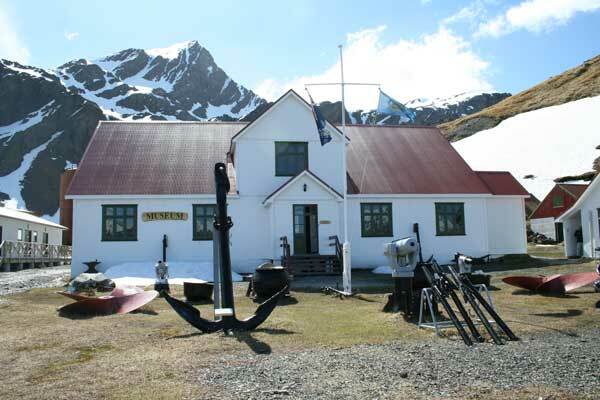 She sur­vived the Great War but never returned to her home port; she was sold into a new life of whal­ing, seal­ing, and explor­a­tion in the far South Atlantic, and lies today at the derel­ict whal­ing sta­tion of Grytviken in South Geor­gia, where she nar­rowly escaped the Argen­tine scrap deal­ers’ atten­tions at the out­set of the Falk­lands War in 1982; and from where, it is hoped by a group of MPs and many oth­ers, she may one day be repat­ri­ated. Media interest in the book is mount­ing: An art­icle in last week’s Sunday Times, fea­tures in pre­par­a­tion for many news­pa­pers in York­shire and the North-East, where Viola served in the War, reviews and extracts in his­tor­ic­al magazines and mari­time journ­als, and only today an excel­lent inter­view with prin­cip­al author Robb Robin­son on BBC Radio New­castle.